For those of you that have traveled to Thailand or other parts of south east asia, you may have come across someone wearing a 'Tubing in the Vang Vieng' tank top or possibly shorts. 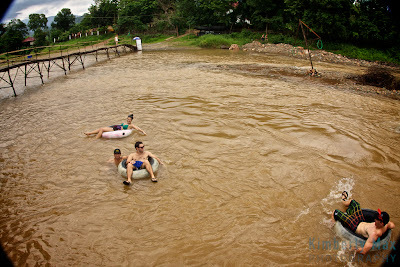 We met a lot of people that got stuck in Vang Vieng. Their wrists were loaded with bracelets that marked the number of days they had been down to the river. Some people even find work either at the bars on the river, or in western run restaurants. The scenery is beautiful with stunning lime stone cliffs, and the locals you meet are very kind. One women we met told us that the next time she saw us we would have 2 babies 1 time. We're convinced that this women for-saw twins in our future.